I wasn’t going to bother posting this. Grilled steak isn’t news. Nor is salad…although I couldn’t stop digging my fork into this one. 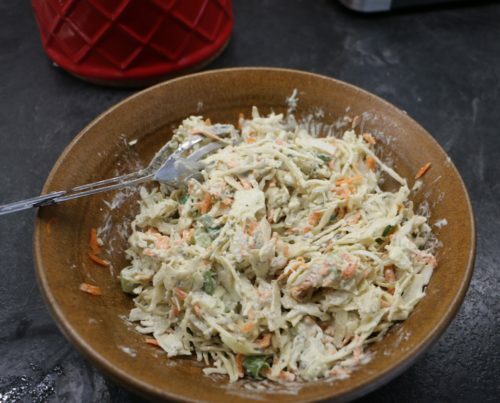 Blue cheese and crunchy cabbage…really addictive! Then I realized just how great it is to have in your back pocket of summer recipes. 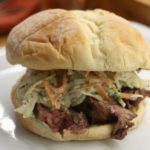 It’s a make ahead kind of meal that you can pack up for a picnic, or take for a weekend camping adventure, or in your RV, or keep in your boat cooler, or simply enjoy in your own back yard. I used one filet (absolutely cannot stand risking tough meat so when it comes to beef I splurge but flank steak is another perfectly fine cut for this). More than enough for the two although you could easily spread it out over four servings but we were feeling particularly pigish. Generously seasoned with salt and pepper. Other than that, naked meat. Everyone has there own grilling technique but I swear by hot grill (about 400-500 °), for a 1” thick steak, sear four minutes then turn 90° for another 4 minutes. Flip side four minutes, then a final four minutes. 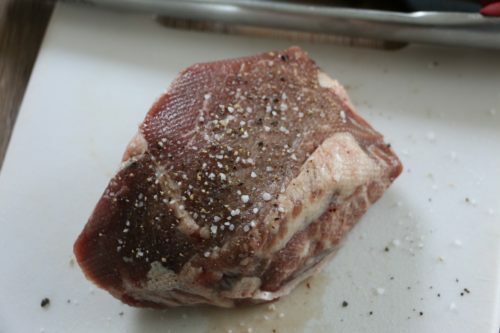 Fifteen minutes resting before slicing. 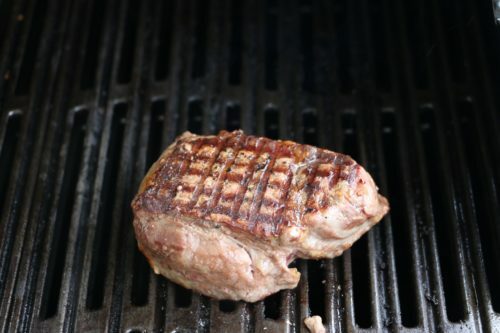 When it’s grilled like this you get a lovely light salt and pepper crust on the exterior, a perfectly juicy medium rare interior and some impressive grill markings. The salad comes together nicely with a simple blue cheese dressing but I kept going back for another little fork-full. Surprising there was any left for the sandwich. 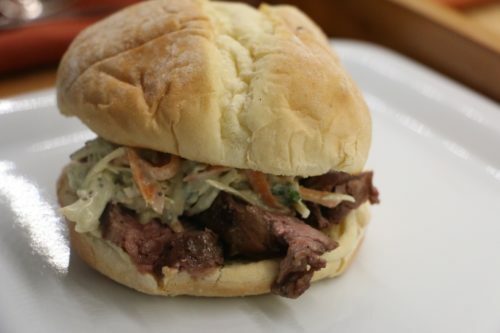 The salad and the steak on their own would make a great addition to any meal but together piled inside a gently toasted bun…pure barbecue summer heaven! Add cabbage slaw, grated carrot and onion and stir to combine. 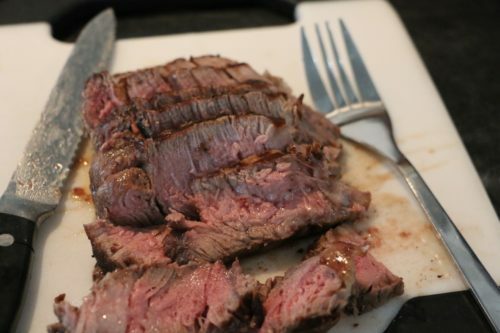 Remove steak to a plate and let rest about 15 minutes. Slice the steak against the grain about 1/4” thick. At this point you can refrigerate until ready to assemble your sandwiches if you are planning on having later in the day.